MUSIC BY MULTIPLE GRAMMY BANDS!! And Special Guest Direct from Louisiana: Chef Mould!! What do you get when the women of NY’s top Cajun bands combine their musical talents? C’est Bon Cajun Dance Band: hard-rockin, foot-stompin, girl-powered Cajun dancehall music! 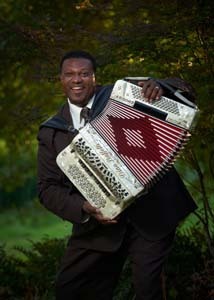 The 2011 Cajun/Zydeco Grammy winner for his album Zydeco Junkie is known for bringing a surplus of infectious energy to the stage every single evening and letting it trickle throughout the band and to those their hips and feet.